Domaine Andron is situated in the little village of Saint Seurin de Cadourne (just north of Saint Estèphe and not far from Pauillac) being neighbours of the famous chateau Sociando-Mallet.Three First Cru vineyards are within 20 minutes away (Chateau Lafite Rothschild, Chateau Latour, Chateau Mouton Rothschild). Domaine Andron dates back to the early 19th century. It became a “Cru Bourgeois” in 1892. One of the last owners in the 20th century was also senator in Paris. The vineyard was sold to various neighbours around 1980 and the name ceased to exist. Domaine Andron was restarted by foreign investors in 2006. In 2009 ERWU-projects took over management. The harvest of 2009 received a first time 90 points from WineSpectator, after Rene Gabriel already highly rated the 2009 and 2010. In February 2013, WineSpectator listed Andron with 91 points for the 2010! 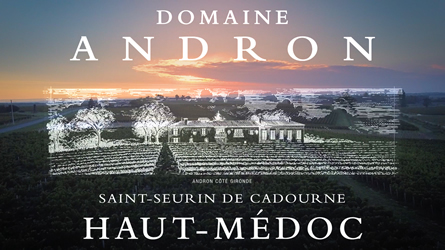 In November 2013 Domaine Andron was sold to a Chinese entrepreneur who saw the value of this small domain which at that time was in need of some investments in improving and modernizing the wine-making and storage facilities and the vineyard. ERWU-projects with Erik Wuite and Jerre Hoekstra were re-appointed as team to continue to manage Domaine Andron. In december 2013, James Molesworth, Senior editor of WineSpectator came to visit Andron. In February 2014 WineSpectator upgraded the earlier “en primeur” points of the 2011 to a 89 points. Very good for a difficult year and better than many of our competitors! In winter/spring 2014 an army of workers turned the building into a pleasant house for the owner and further improved the wine-making and storage facilities to be more in line with the very high WineSpectator(89-91) and Rene Gabriel (18/20) points over the bottled years 2009-2011. The en-primeurs points for 2014 were 88-91 points. As of spring 2015, Domaine Andron is used as a yearly case-study location for the new (2 year) Master of Business and Sciences in Vineyard & Winery management by the Bordeaux National School of agriculture engineering (Bordeaux Sciences Agro), also in cooperation with Prof. Kees van Leeuwen. Very proud!